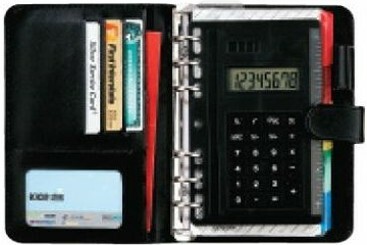 Wholesale Personalized Organizer with Calculator -Bulk Day Planner-Portfolio. Promotional, Cheap. Leatherette, 6 Ring Day Planner, Wallet. Budget Prices for USA, Canada. 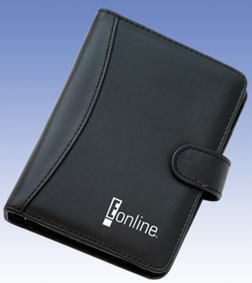 Bulk promotional leatherette (imitation leather) organizers and planners with many extras, custom imprinted with your logo. A wallet for your cards and a handy 6 ring day planner for the active person. Complete with solar calculator and address and phone book with tabs. We also supply blank (not imprinted) planner organizers for $6.75each. Lowest prices in the USA and Canada for wholesale personalized day planner organizers . Free artwork design. American clients pay no taxes. We will send you a proof for your approval before production. Unit Prices below include your 1 color, 1 side imprint. Add $0.50 for each extra imprint color. Setup Charge: $48.00 per imprint color; Repeat Setup Charge: $25.00 per color. Additional Imprint Colors: add $0.50 per organizer, per additional imprint color. Pockets for Business Cards, etc. Typical Production Time: 7-10 days after artwork approval; 3 days rush production is available: contact us. Packaging: 24 units per carton. 26 lbs per carton.